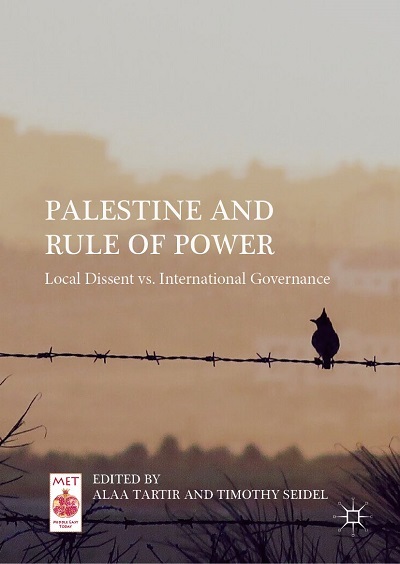 Palestine and Rule of Power: Local Dissent vs. International Governance explores how the rule of power relates to the case of occupied Palestine, examining features of local dissent and international governance. The book considers expressions of the rule of power in two particular ways: settler colonialism and neoliberalism. As power is always accompanied by resistance, this book engages with and explores forms of everyday resistance to the logics and regimes of neoliberal governance and settler colonialism. The book interrogates wide-ranging issues and dynamics related to international governance, liberal peacebuilding, statebuilding, and development, the claim to politics, and the notion and practice of resistance. Alaa Tartir is a research associate at the Centre on Conflict, Development and Peacebuilding (CCDP), and a visiting fellow at the Department of Anthropology and Sociology (ANSO), at the Graduate Institute ofInternational and Development Studies (IHEID) in Geneva, Switzerland. Tartir is also a researcher at the Graduate Institute’s Small Arms Survey (SAS) and the coordinator of the SAS’s Security Assessment in North Africa (SANA) project. He is also a policy and program advisor at Al-Shabaka: The Palestinian Policy Network, and a visiting professor at Paris School of International Affairs (PSIA), Sciences Po. Among other positions, Tartir was a post-doctoral fellow at The Geneva Centre for Security Policy (GCSP), a visiting scholar and lecturer at Utrecht University, and a researcher in international development studies at the London School of Economics and Political Science (LSE), where he earned his PhD. Tartir is the co-editor of Palestine and Rule of Power: Local Dissent vs. International Governance (Palgrave Macmillan, 2019), and the author of Policing Palestine: Securitising Peace and Criminalising Resistance in the West Bank (Pluto Press, 2019). Timothy Seidel teaches courses on politics, development, and peacebuilding in the Department of Applied Social Sciences and the Center for Justice and Peacebuilding. He also serves as director for the Center for Interfaith Engagement (CIE), a center that promotes collaboration among scholars and practitioners and partners with community and national organizations to build a more just and peaceful world through inter-religious and intercultural understanding. Seidel has worked in various development and peacebuilding contexts in North America and the Middle East, including serving for several years with Mennonite Central Committee (MCC), first as peace development worker in Palestine-Israel and then as director for Peace and Justice Ministries in the U.S. Seidel previously taught at American University and Lancaster Theological Seminary. He holds an MTS from Wesley Theological Seminary and a PhD from the School of International Service at American University in Washington, DC.